Retired executive officer of the Peterborough and the Kawarthas Association of Realtors, Carolyn Mills began the Sweet Dreams program, in 2011. Sweet Dreams provides comfortable pyjamas, bedding and pillows to the Kawartha Haliburton Children’s Foundation to be given to children in our community who are receiving assistance from the Kawartha-Haliburton Children’s Aid Society. Children often arrive at new foster homes with very few possessions. Many don’t have pyjamas to wear that first night with a new family, and it’s a very crucial night. Away from their own families and away from familiar surroundings, snuggling up in cozy new pyjamas and new bedding, chosen just for them gives these children a sense that someone cares. Hopefully, it also brings the feeling of a warm hug at bedtime. The Foundation, Carolyn and the Sweet Dreams program also provides pyjamas and bedding to families participating in the KHCAS Family Preservation Program. As needed, bedding items are delivered directly to families by KHCAS social workers to their homes or to their alternative care settings. 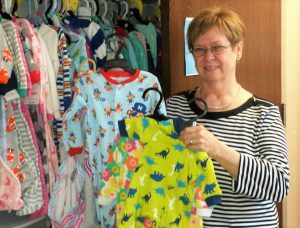 For all she does, we offer Carolyn Mills many thanks as warm as the pyjamas she provides for children and families in need.